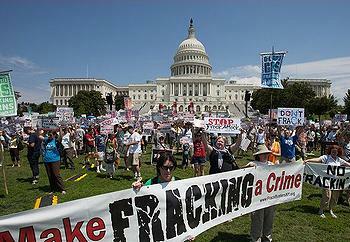 WASHINGTON, DC, November 8, 2012 (ENS) – Roughly $30 million in campaign contributions have flowed from the oil and gas industry to congressional candidates and political action committees in 2012 to stall regulation of hydraulic fracturing, or fracking. 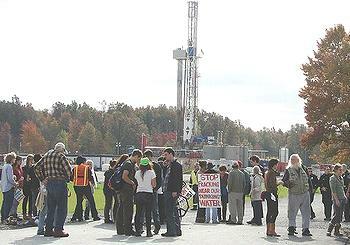 Now many towns have swung into action to pass fracking bans to protect their citizens. Fracking is a technology that blasts millions of gallons of water, chemicals and sand underground to release oil and gas by fracturing shale bedrock. A growing boom in natural gas drilling near homes and schools prompted the city of Longmont, Colorado to vote last July to bar new oil and gas permits in residential neighborhoods. The state quickly overturned the ordinance. Governor John Hickenlooper said that letting it stand would “stir-up a hornet’s nest,” encouraging other Colorado towns to pass their own drilling rules. Longmont Mayor Dennis Coombs argued that communities have the right to restrict heavy industry in residential zones – including oil and gas drilling. The natural gas “gold rush” underway in 31 states is indeed “stirring up a hornet’s nest,” sparking pushback from communities that see themselves as the last line of defense protecting citizens against state and federal failures to regulate fracking. “The U.S. faces a crisis in the enforcement of rules governing the oil and gas industry,” states a new report by Earthworks’ Oil & Gas Accountability Project. Their study, which analyzed government data from six heavily-fracked states, discovered that each of them failed to enforce existing drilling regulations. Between 53 and 91 percent of active wells in those states go uninspected – 175,000 to 300,000 wells in all – because the state lack inspectors and the funding to pay of them and provide them with the necessary equipment. As a result, many violations go unrecorded, with few penalties and many repeat offenders. With just 17 inspectors for 60,000 wells in West Virginia, municipalities and environmental groups are calling for a moratorium on drilling until various safeguards and monitoring criteria are met. North Carolina’s controversial moratorium on natural gas drilling runs until 2014, when the legislature will vote on as-yet-unwritten regulations. But Raleigh, North Carolina and Morgantown, West Virginia, as well as other communities aren’t waiting for state action. They have preemptively passed local drilling bans or strict zoning rules. New York State’s contentious 2010 moratorium on natural gas drilling remains in place, with Governor Andrew Cuomo launching a new health study, and the state Supreme Court upholding municipalities’ rights to ban drilling within their borders. At least a dozen New York communities, including the City of Buffalo, have passed such bans. Next door, in Pennsylvania, the legislature passed a law earlier this year forbidding towns from regulating fracking, which was then overturned by the courts. Five Delaware Valley towns quickly asserted their “home rule” rights and prohibited fracking. In Texas, the towns of Flower Mound, Grapevine and Southlake chose to regulate fracking within their city limits after the industry had heavily impacted their towns. Those ordinances include buffer zones that distance wells from homes, schools, churches, and hospitals. 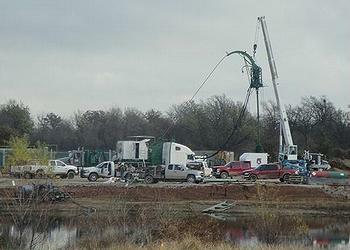 Southlake banned summertime fracking due to the industry’s heavy use of water needed for drinking. Across the nation, this local opposition is occurring in a vacuum. The federal government does not regulate hydraulic fracturing, and the industry – unlike any other industry in America – is exempted from seven major environmental regulations. On this, the 40th anniversary of the Clean Water Act, fracking gets a pass, along with exemptions from the Clean Drinking Water Act, the Clean Air Act, the Superfund law and hazardous waste disposal regulations. Only four states have significant regulations that apply to fracking, which seem to go largely unenforced. Meanwhile, the U.S. Environmental Protection Agency has conclusively proven that fracking contaminated an aquifer in Pavilion, Wyoming, refuting longstanding industry claims that the process does not pollute drinking water. Across the state line, a Colorado School of Public Health study released earlier this year found high levels of airborne petroleum hydrocarbons near drilling sites in Garfield County, levels that could cause acute or chronic respiratory and neurological problems. Municipalities are increasingly concerned over health and economic impacts from frack water and air pollution. Drillers transform quiet rural communities into industrial zones with wells, waste ponds, smog, roaring compressors and heavy truck traffic. Robert Kennedy Jr., president of the nonprofit Waterkeeper Alliance, estimates that it takes over 4,200 truck trips to carry fresh water in and contaminated frack water out of each well site. In Ohio, a grassroots “limited home rule” campaign seeks to regulate drilling by drafting community noise limits, designating operating hours, and limiting truck routes and drilling waste shipments. The strategy would, if approved, supercede Ohio Department of Natural Resources authority over drilling, passing it back to municipalities. In Broadview Heights, Ohio, an upscale city dotted with 90 wells, a Charter Amendment on the November ballot would ban future drilling, citing citizens’ rights to clean air, clean water, clean soil and a sustainable energy future. On Election Day Broadview Heights voters approved the amendment. A similar Charter Amendment was adopted by voters in Mansfield, Ohioby a wide margin. 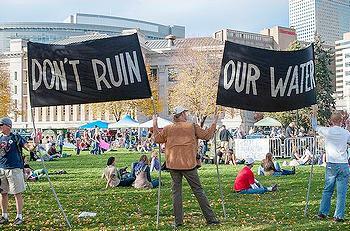 At least 30 Ohio communities have passed statutes to regulate or ban fracking. Not one state, nor the federal government, currently requires drillers to disclose “proprietary” drilling formulas, which contain chemicals known to cause cancer or disrupt hormones that regulate basic body functions, including benzene, toluene, diesel, and formaldehyde. Oil and gas companies pumped 780 million gallons of fracturing products underground from 2005-2009 containing about 750 different chemicals. Of the 353 chemicals identified by researchers in a recent study, about half could harm the nervous system, the cardiovascular system and blood, 40 percent could disrupt immune function, about a third could affect endocrine organs, and a quarter could cause cancer. A new Pennsylvania law demonstrates how states favor drillers. Companies there are now required to reveal “trade secret” chemicals to physicians, but doctors must first sign a confidentiality agreement. Ohio’s new fracking rules include a similar provision. The roots of the regulatory breakdown lie with elected officials who take hefty campaign contributions from frackers – then pass industry-friendly rules. The oil and gas industry has already handed at least $30 million in 2012 campaign contributions to members of Congress and fossil fuel political action committees. A flag-waving “Vote 4 Energy” TV ad boasts job creation, though most frack jobs are short-term and go to out-of-state, transient workers – often attracting drugs, prostitution and crime to communities. But the roots of this problem go deeper. “If we are ever to develop an ecologically sustainable economy, we must free ourselves from the existing system of legal incentives that is compelling us to destroy the Earth. Our law must enforce a limit to the scale of environmental damage that we are collectively permitted to impose on the Earth. This would represent a transformation in the law’s understanding of the public welfare and a dramatic evolution in the structure of property law,” Guth writes. REACH, the European system of regulating chemicals that took effect in 2007, stands in stark contrast to the U.S. model. REACH makes industry responsible for assessing and managing the risks posed by chemicals and providing appropriate safety information to their users. The European Union can take additional measures on highly dangerous substances. Since President Barack Obama took office in January 2009, the Department of the Interior has authorized 33 renewable energy projects, including 18 utility-scale solar facilities, seven wind farms and eight geothermal plants, with transmission corridors and infrastructure that will enable the projects to connect to established power grids. When built, these projects will provide enough electricity to power more than 3.5 million homes, and support an estimated 13,000 construction and operations jobs, according to project developers. This pace of renewable energy development is much faster than at any time in the past. Still, federal and state officials have not done all they could to shift towards renewables.